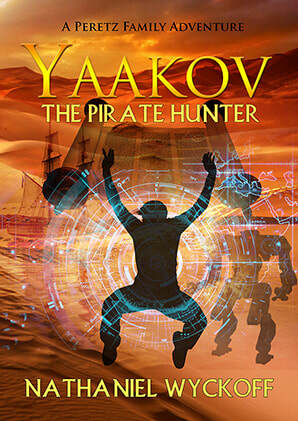 ​Get Yaakov the Pirate Hunter FREE! Just hit the button below to grab your FREE book. "In fact, the books in Nathaniel Wyckoff's Peretz Family Adventures series have similar qualities to those of a soap opera, in that one can't wait to view the next installment!" The series continues with Yaakov and the Treasures of Timna Valley. The last thing that Yaakov heard was the pink-shirted man's voice...Then, everything turned to black. Keep on adventuring in Yaakov and the Secret of Acra Fortress. "And if someone tries to break inside, he is going to set off his bombs and blow up the whole place." Join a daring treasure hunt in Yaakov and the Jewel of Jamaica. He struggled to keep his vehicle in the air...but the fast-approaching treetops didn't seem to care. Series available now in paperback and on Kindle.